A document I compiled with assistance from the Campaign for Better Transport and distributed at today’s public meeting including Hawkes Bay mayors, Regional Transport Committee and Chamber of Commerce. The cost of maintaining the rail line is $2 million per year. Roading is far more heavily subsidised than rail. The Ministry of Transport did a study in 2005 (currently being updated), which concluded that trucks only meet 56% of their costs while motorists pay 64%, buses pay 68% and rail 77%. Roading is NOT self funding through user charges. The shortfall is $1.5 billion per year for state highways, plus ratepayers fund local roads. So any official that claims that is completely incorrect. That shortfall, made up by taxpayers, is already several times what is proposed to be spent on the rail operation and is far from the only taxpayer subsidy given to roads. The government is planning to spend $21 billion on roads, local road networks are also heavily subsidised through local authority rates (about another $1 billion a year). There are the greater “externalities” of road transport that should also be factored in: road trauma ($3.5 billion), health problems caused by air pollution, noise, loss of amenity, severance of communities and damage to the environment (including greenhouse gas emissions, which have increased by more than 70 per cent since 1990). The cost of maintaining roads (excluding state highways) in the Gisborne region alone is $19.15M (incl. ratepayers contribution of $7.85M). The government will happily sink millions into the Hawkes Bay airport run way lengthening even though there are no airlines guaranteeing to bring in larger planes… or even if there is a market for larger aircraft at the airport. So if the government will take a gamble with that, why not invest in setting up a successful tourist rail service in the region? The government is spending over $40million straightening a short piece of the Napier-Gisborne highway which will result in a net travelling time gain of less than 60 seconds over a 3 hour journey time. Investing $2-10 million on the line would provide the Gisborne region with a line with higher increased speeds for trains. That includes some work on two tunnels (KiwiRail mentioned cost of around $200,000) to allow Hi Cube containers to be moved on rail instead of road (the trucking lobby will be worried about this). Anne Tolley received a personal campaign donation of $5,000 from the trucking lobby group Road Transport Forum. The National government is committed to support the trucking industry which is one of the Party’s biggest campaign donors. A number of local roading contractors will lose their jobs shortly. Having the rail line functional again would mean immediate and long term maintenance and logistics jobs for the region. Until Tranzrail killed off wagon loads out of Gisborne (1999-2001) the line had two return freight trains a day and one a day in weekends. Hikurangi Forest Farms new mill may generate enough product to fill 200 wagons a week and other exporters are also interested in the option of rail if it is competitively priced so there could be more than one ‘anchor’ client and the line shouldn’t depend just on HFF. The train speed between these two cities is the same as trucks (and often better due to poor weather, ice and washouts on the state highway). KiwiRail could run the line to the local business conditions. KiwiRail should have a sales manager based in Gisborne and Napier. They should load single wagons if clients only require that. They should have some contracting trucks to pick up freight from clients premises. One train can carry the equivalent of 280 trucks or more. While road vehicle efficiency stagnated over the past 30 years, trains fuel efficiency has increased 104%. Currently the line has one freight train a week, sometimes two. It is the most scenic route in the North Island as the line runs along the East Coast, high on cliffs for much of the trip. There is current demand for Gisborne-Napier passenger services and a number of bus services run between Gisborne-Napier (with trains going onwards to Palmerston North and Wellington) there really is no reason why passenger services could not be re-started. Passenger rail demand on some lines has increased over 50% in the past 12 months according to Kiwirail figures. Next year Tranz Scenic will have a number of spare large window carriages as new rolling stock arrives for the South Island long distance services). Passenger rail has many advantages over buses – the scenery is far better (that’s why the Tranz Alpine train contributed to the end of bus services between Christchurch & Greymouth); on-train buffet car, toilet facilities, larger seats and tables for working while travelling, larger windows and open air viewing platforms; rail line has been less susceptible to closures/washouts than the highway. 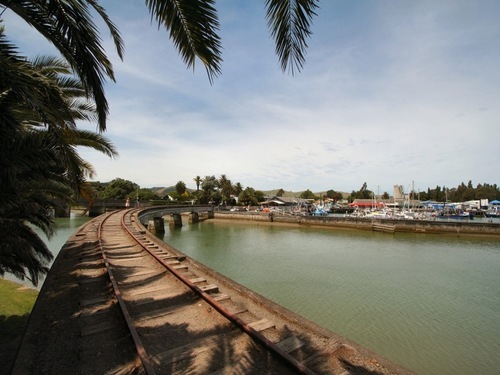 A daily passenger train could also be used to haul some freight wagons (as the Northerner did until the 1990’s, and many trains do overseas) – this would mean more freight options for Gisborne clients. Gisborne can benefit in more ways by keeping the rail line open and running better freight services. The passenger services will be the cream on the top to bring the region forward to more tourists, both domestically and internationally. Perhaps even Hawkes Bay airport would benefit with future airlines connecting from Australia, then passengers taking the scenic train service to Gisborne? The Tranz Alpine service was once almost about to close until one entrepreneurial staff member at NZ Railways came up with a tourist train. 20 years later it carries the most passengers out of all long distance trains! The same could be done on the Gis-Napier line thanks to its scenic opportunities. The Dunedin City Council owned Tairei Gorge Railway, based on a scenic branch line out of Dunedin which was threatened with closure in 1990. It is now a highly popular and successful operation. The business case of using KiwiRail only for bulk freight came about during the failed “Beard Era” of chairmanship of Tranzrail (1999-2001). Beard, at great cost of traffic and revenues to Tranzrail, closed down freight terminals and sidings to factories throughout NZ. Just a few years earlier under chairmanship of Ed Burkhardt Tranzrail built the Gisborne line up to 20+ trains per week.